My client wanted me to use this font for her charity event. I looked at the "read me" text file, and it said that you can't use it for any commercial use, unless you have permission. My question is, why the heck is this under "commercial free" fonts, if it's not EXACTLY commercial free? Cute font though! Wish I could just use it without needing to wait for permission to use this font. I don't know what you mean. It's listed as "Personal use only, no commercial use. Licensed as: Freeware, Non-Commercial". Nice for a cartoon ! @fantabulousgabby You can steal fonts. *laughs* its kinda not against the law to take fonts for free. @scratchU8 You won't go to jail for 'stealing' fonts, but you can get sued. 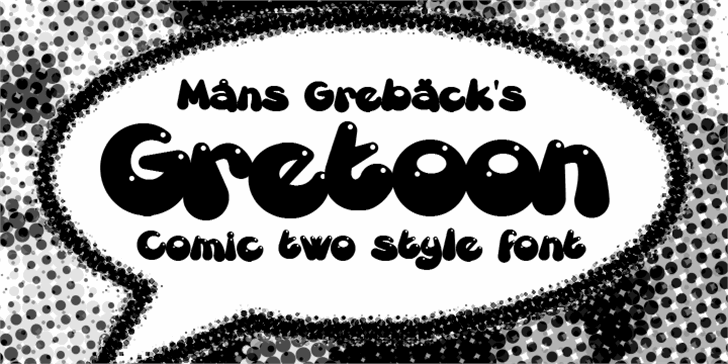 Gretoon is a trademark of Måns Grebäck.